SGIA Expo 2016: Thank You! The SGIA Expo boasted another record-breaking show in Las Vegas! The Top Value Fabrics team enjoyed another incredible show with old friends and new. We were proud to show off our new booth by Matrix Frame with graphics by Meno. Our backlit booth display was printed on our new Supernova, and we were honored to have also won two Product of the Year awards at the show. Thank you, voters! The awards were for Media in Textile Framing Systems and for Media in Textile Banner. We enjoyed yet another terrific industry show - special thanks to all who visited us in fabulous Las Vegas. 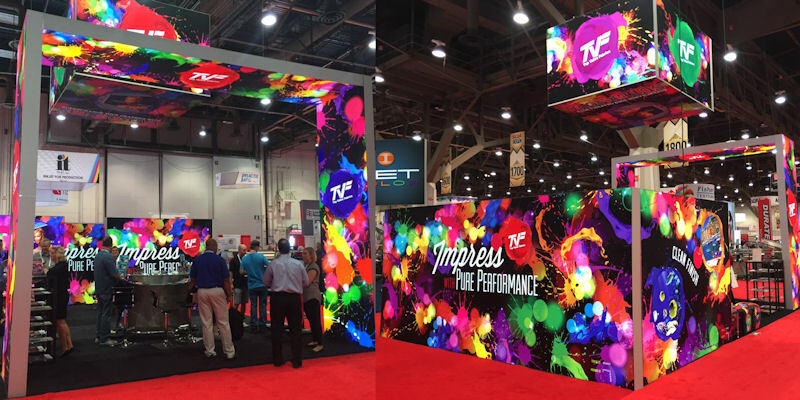 We love to help our customers find the best solutions for their needs and we're proud to offer a complete line of superior print media from Frontlit and Backlit to Blockout, PET, Mesh, Polypropylene and three lines of Specialty Textiles. Call us toll free today to learn more about our media or to request samples at 855.618.4500.